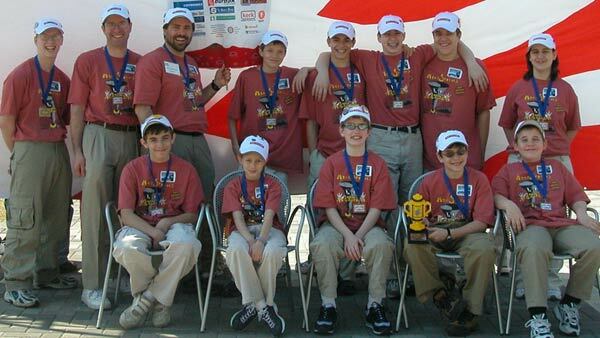 Members of the Mindstorms Mayhem FIRST LEGO League team are, from top left, mentor Christopher Jennings, Merrimack; coach Ken Streeter, Bedford; coach Bill Gray, Milford; Nathan Gray, Milford; Benjamin Krupkin, Milford; Brian Jennings, Merrimack; Benjamin Streeter, Bedford; and Victoria Umenhofer, Wilton. From left at bottom are Jacob Krupkin, Milford; Melissa Gray, Milford; David Schunemann, Hollis; Nathan Streeter, Bedford; and Daniel Umenhofer, Wilton. 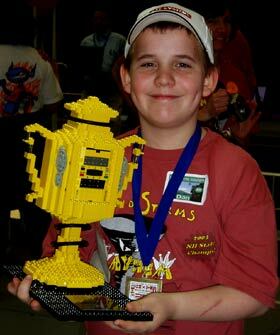 Daniel Umenhofer, 10, of Wilton holds the Director's Award trophy that Mindstorms Mayhem won at the FIRST LEGO League International Invitational in Atlanta last weekend. Mindstorms Mayhem, a FIRST LEGO League (FLL) robotics team consisting of home schoolers from Wilton, Milford, Merrimack, Hollis, and Bedford, won the Director's Award at the FLL International Invitational Tournament in Atlanta this month. The award is given to the team that excels in all judging categories. The New Hampshire team competed against teams from 39 states and five nations to win the award. The team, sponsored by BAE Systems, earned its place in Atlanta by beating out 48 other teams from around New Hampshire in the state finals competition last December. During the three-day invitational last weekend, the team's robot competed against other robots to complete nine "Mission Mars" challenges in a set period of time. The missions were designed to simulate those obstacles faced by NASA scientists and engineers in the Mars rover missions. Teams were judged in technical areas, research and team work. The New Hampshire team presented its research as a channel-surfing skit. In five minutes, the judges saw a game show, a news interview, a science talk show, a rap song, and an interview with a robot designer. Mindstorms Mayhem was also awarded the "Special Assignment Award" with their alliance partners from Alaska, Mississippi, and North Carolina. Purpose of that competition was to teach cooperation between rival teams. without the permission of The Union Leader. Articles from The Union Leader and New Hampshire Sunday News, September 1989 to the present, are now available online through NewsBank.